I admit. I looked twice when I saw this sign on Highway 61 inside the border not too far from Grand Portage. For an area depending much on visitors a sign telling tourists with camper and boat behind to expect over a hundred miles of road construction might be enough to get many to turn around and give it up. 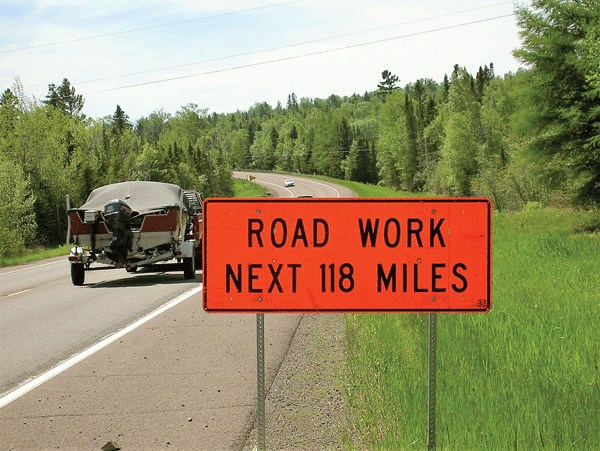 Any Midwesterner can joke about summer season really being the construction season, but to look down the barrel of over a hundred miles of road work is more than a little pause making. Not far beyond the Twin Ports on Highway 61 is the mate to this sign telling those headed up the shore what to expect (or dread as case may me). But, it’s really not that ominous because the meaning behind the signs is simple and practical enough. Instead of a semi load of signs for each project one big pre warning was thought to do the job. This makes sense. When replacing as many culverts and doing bridge repairs as the MHD has planned for this summer a blanket fore notice covering essentially the entire North Shore was a tidy problem solver. We already expect traffic delays during construction season. This just says expect them the next one hundred and eighteen miles. Have a nice day. I can’t help it. I find this a bit funny, no less so that the one hundred and eighteen mile warning ends with a simple declaration of END ROAD WORK on the opposite side of the highway. It’s so simple you’d hardly notice it was, so to speak, over. With a huge volume of culverts and bridges to maintain the MHD contractors can potentially be busy until freeze up ends the months of construction with the season of plowing. This got me to thinking it is too bad life didn’t have more practical, common sense postings as the MHD uses. Instead of road work announcements on signs wouldn’t it be nice to get other forewarnings? How about finding a sign outside the door or on your way that read EXPECT DIPS and POTHOLES NEXT 100 YEARS. A reminder like that would always be timely, not that we all want to be reminded of the obvious, especially if it might be painful, like a Toll Road. We all know there will be some rough road ahead. It can’t be helped or avoided. At some point every one of us will be delayed by flagmen, choked by clouds of road dust, or unexpectedly shot to the car roof by an axel breaking gap in the roadway of life. An occasional reminder might not be out of place, not that this is a job for the MHD or any other governmental unit. Expertise in doing roads and bridges doesn’t necessarily mean an arm of government would be any good (or have any business) guiding us down the pathway of life that suits us well enough. Instead of warnings to EXPECT DELAYS or UNEVEN SURFACE NEXT 100 YEARS maybe there could be signs advising SPECTACULAR VIEWS NEXT 100 YEARS or UNEXPECTED JOYS AHEAD. Most of us need no reminder to grouse about the bad stuff, so maybe a counter tactic is a good thing for putting a little of the mystery and delight into life. What’s more important? Is it the pothole or how we handle it? There’s a Gunflint Trail story I’ve enjoyed partly from knowing the characters but also because it gets at some of what makes life adventurous or not. Frank Powell learned to fly in WW I and did lots of float plans bush flying in the early, simple days when pilot and mechanic were one in the same. The tale is Frank and his co-pilot wife lifted off Grand Marais harbor for the return to Saganagons, a trip they’d made often enough to know by heart. As they neared home heavy fog and overcast settled in. They could not see the ground, but having carefully watched clock and compass Frank knew they had to be close. What to do? He slowed air speed and circled as he and his peered down hoping for a break. It came when his co-pilot with head outside called “I hear ducks.” Frank responded in two beats “I’m putting her down.” So, down they went on the hope that ducks meant water and water meant a safe landing. It’s hard to imagine anyone having that degree of savvy, faith, confidence, or whatever you care to name it. Though I’ve done my share of risk taking in a canoe, putting a plane down because you hear ducks makes as much sense to me as paddling over Kakabeka Falls hoping fortune will keep you alive. Indeed, fortune might preserve you, but once you’ve passed no-turning-back there’s not a way to know until it’s over one way or the canoe’s your coffin. If I set aside words and warning signs a while whatever you believe in or however you will be as a person is going to be its clearest in what you do. An individual can speak of peace but if they act standoffish, arrogant, and accusatory they are not behaving peacefully. Saying one believes in brotherhood and equality is far easier than living up to any standard we’d use to measure such an ideal. What we believe (and if we look for it the source or breeding ground of belief) is clear as a live-long day in how a person acts. Proudly setting yourself apart from others is not a behavior of peace and human brotherhood. The content of faith or belief speaks what it is if it takes the believer into a club where they can start killing “evil wrongdoers.” There aren’t many reading this who at a time or other didn’t wish to sweep aside some person or group they thought ill. To do so requires specific prompts and traditions I’m glad most of us are missing. This might help along the road of life. FALSE WORDS DO NOT HIDE BAD ACTS.